Atlantic City, 1920. When alcohol was outlawed, outlaws became kings. HBO presents Season One of this epic new drama series that follows the birth and rise of organized crime in 'the world's playground' at the dawn of Prohibition. Steve Buscemi heads up the cast as Enoch 'Nucky' Thompson, the city's undisputed czar who is equal parts politician and gangster. 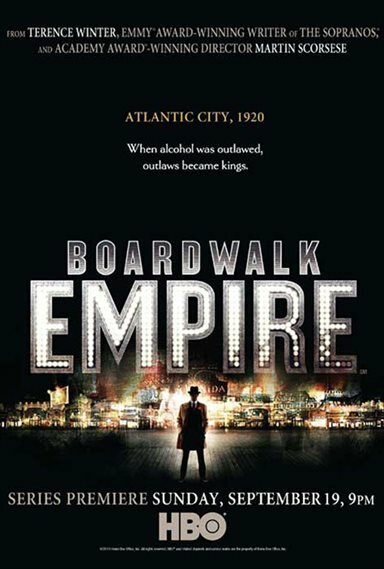 With illegal alcohol opening up lucrative opportunities, Atlantic City becomes a major hub of bootlegging activity as Nucky and his inner circle preside over notorious backroom politics, vicious power struggles, a constant onslaught by the Feds, and Nucky's own insatiable appetite for women, profits and power. Download Boardwalk Empire in Digital HD from the iTunes store. Boardwalk Empire images are © HBO. All Rights Reserved.